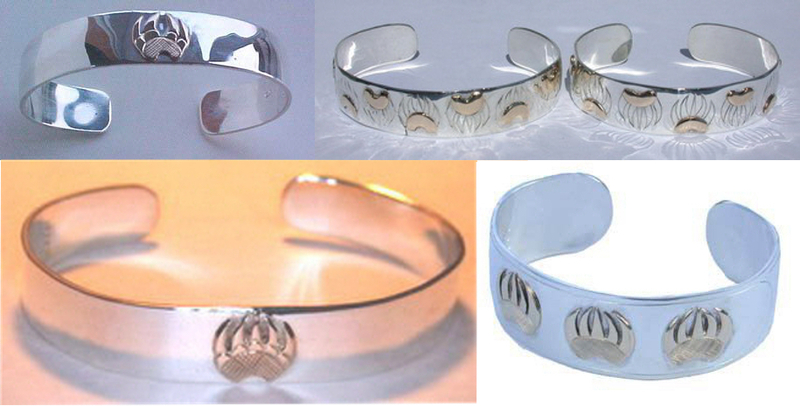 Appliqued-Bracelets are custom made with applied ( soldered ) ,gold , silver or platinum. 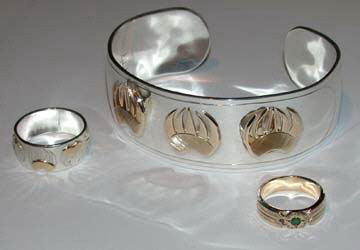 Gemstones can be added. 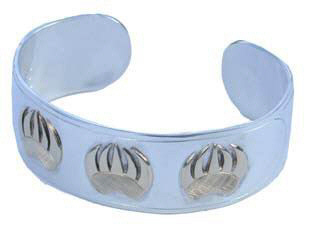 Unique cuff jewelry by Bearclaw Native American Indian Jewelry, Engraved, cast constructed one-of-a-kind art. 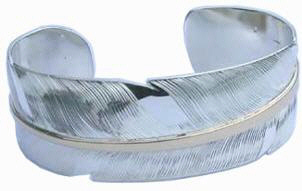 Other styles are available and very possible to do. Let me know what you would like and I’ll see what I can do. I’ll do the technical, and you do the ‘ I like this and this ‘ part of it.. 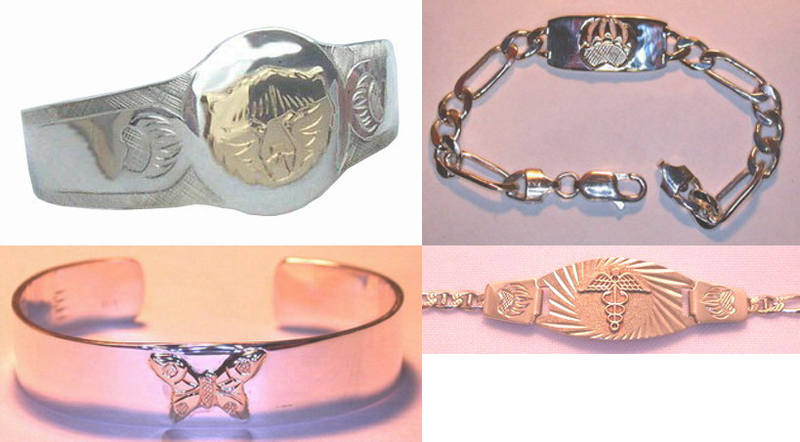 There are some very creative Medical Alert style bracelets or this gem bracelet designs and shapes possible. 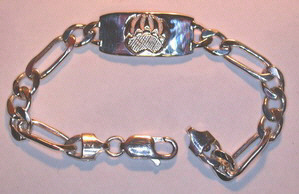 BA2b Wolfpaw in 14k gold on silver 5/8″ (this bracelet was sold to the guy that trains Wolves for the Movie Industry. You’ve seen his back during a movie if someone is getting attached by wolves. He’s actually playing with his pack…) I think he did shows like White Fang. 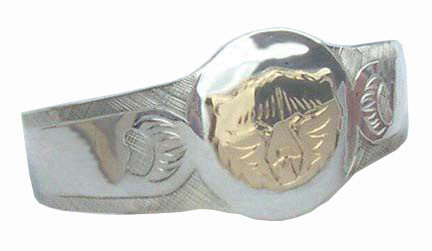 BA2 3– 14k gold Grizzly paws appliqued on silver ( this is the bracelet I made for the ‘ Making Bearclaw Bracelets ‘ procedure page. 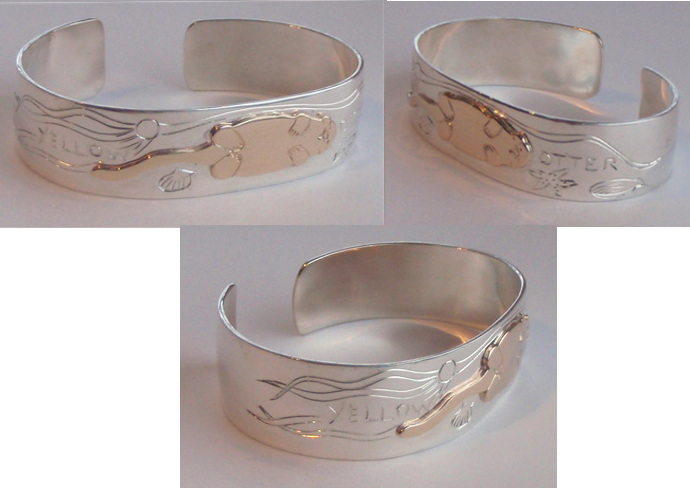 These appliqued Bracelets are custom one-of-a-kind gold and silver bracelets by Bearclaw Native American Indian Jewelry, using precious metals, all gold variations 9 Yellow gold, rose, white, green gold ), and karats, from 10k to 22k , ( but generally 14k-18k ), platinum .95 and 925 sterling silver. 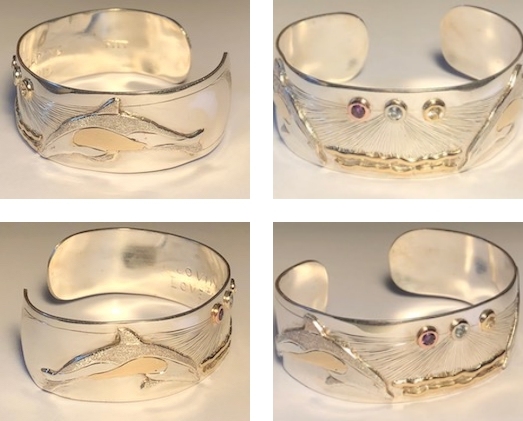 Diamonds, sapphires, rubies and emeralds create Unique Animal and Nature themes by Casting, appliquéd, hand engraving one-of-a-kind Native Indian Art. 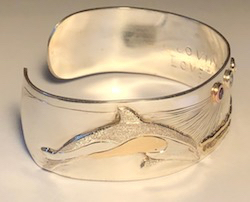 Themes include carnivores such as Bear, wolf and Fox, Birds such as hawk falcon and raven and Water species like whales, dolphins and salmon. 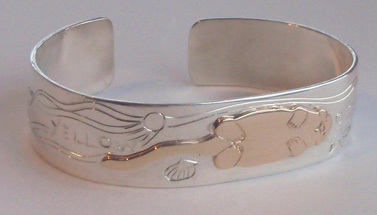 Themes include Native Indian symbols and themes. 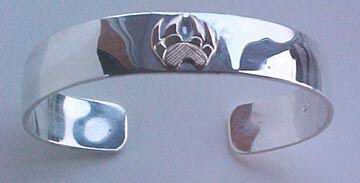 Applique is the method called for soldering one metal on top of the other.